The fiscal year 2018 budget has presented stressful challenges in content and engagement. This is a long article began in 2012 and edited multiple times. The intention of this piece is to break through some of the confusion on jurisdictions as it applied to management and legislation. To read about where we are right now click HERE. Bookmark this page to help you navigate the distinctions between federal, state and tribal jurisdiction. The budget debate for the fiscal year of 2018 has just ended. Usually a budget is passed before a calendar year ends. Fiscal year budgets run from October through September. The debate for 2019 has begun already. It holds exactly the same hurdles as we just jumped. This “hamster wheel” of advocacy in the legislative arena repeats every year with debates in how the government will fund activities; provisions. Until we repeal the Burns amendment (passed in 2004), that allowed the sale to slaughter for wild horses, and pass the SAFE Act, that will prohibit the shipment of an unsafe/unregulated food product, horse meat, it will repeat every year. 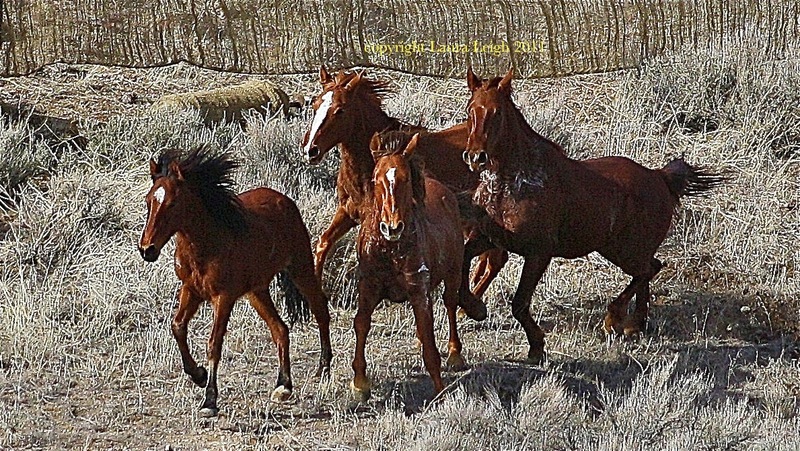 Yet when it comes to America’s wild horses the “web” that governs sale and slaughter becomes rather a tangled one. There is a lot of misunderstanding of how the multiple layers of the US government effects wild horses going to slaughter. The “emotional punch” of an American Icon of Freedom being served up for a foreign dinner plate adds a component that stirs outrage in the hearts of most Americans… yet does not stop those motivated by the money they can make from trying everything in their power to override the wishes of the majority of Americans and the law. The Wild Free Roaming Horses and Burros Act of 1971 was a great intention, as were many environmental protection intentions of the day. The Act was not made stronger, it was weakened, with a lack of engagement. But that is another article. This article was written in 2012 and has gone through multiple edits to keep it current. The jurisdictions have not changed, but some of the specifics have. This article was written in 2012. The agreement mentioned above has gone through a number of changes, disagreements and drama storms of it’s own. As of January 2018 the agreement was cancelled and this entire area is under yet one more upheaval a the state, perhaps in desperation, looks to literally give away ownership of all of the horses living in the Virginia Range. The state does not want to deal with this anymore. It is a very tense time for anyone that cares about these horses. This issue becomes very emotionally charged partially due to the lack of any unified or consistent “management.” In many instances tribal authorities remove and sell these horses into the slaughter pipeline. Sometimes these removals create a huge public interest; many times happen without any knowledge outside the borders of the reservation. Legally these are NOT considered wild horses but the private property of tribal members; most often seen as domestic livestock by the tribe, just like their cows. At this moment (5/2014) the Yakima (Yakama) tribes in Washington state are removing and selling horses through a known killbuyer they have worked with before. 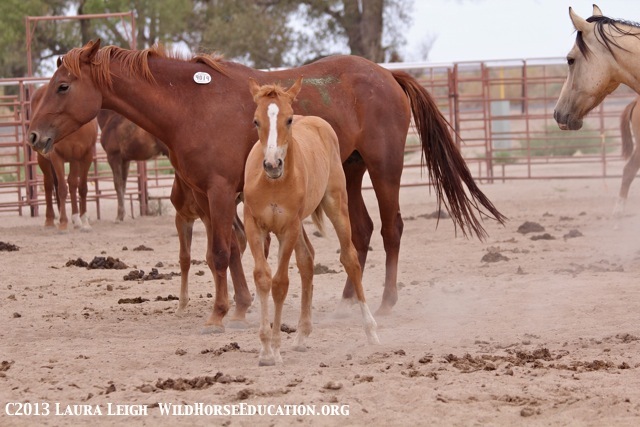 Sorting and handling of horses that have lived “free roaming” can be a time consuming task. Foals have very little value as meat and some killbuyers simply let them die in pens, or simply shoot them, instead of spending money on feed as there would be no profit in the sale later for meat. So this killbuyer loads the semi trucks with adults and ships them out and then “brokers his by-product,” the foals, to “rescue.” This time around the asking price is $100. a piece. The Killbuyer and broker make a nice handful of cash. This is a recurring thing and happens with regularity. This time they have no BLM roundup to compete with in the press… so it is in the public eye. (As a note the Yakima have been pushing for a horse slaughter facility on tribal land. They have repeatedly refused assistance to PZP treat, train and adopt out their horses). As these horses exist on reservation land the jurisdiction lies with tribal authorities. Fast cash is the name of this one… for the tribe and the killbuyer. It is the end of the lines for hundreds of horses every year. For the horse? This is a very dangerous jurisdiction. We have recently seen similar actions in New Mexico with the Navajo and the Pauites of Nevada. In 2018 we saw the Navajo announce “hunting permits” for horses. That action was cancelled. These horses are considered private property and not under any US federal or state jurisdiction. However if the SAFE Act is passed there will be no killbuyer to ship horses across US highways for slaughter. The SAFE ACT (for domestic horses) is the focal point to protect these horses. The USFWS is managed by the Department of Interior (DOI). However USFWS wiggled out of the provisions of the Wild Free Roaming Horse and Burro Act that gave “protections” to wild horses on federal land. Even though these horses have significant documented history as an important living historical monument to America’s “war horse,” we have failed as a nation to give them any protections and they will be removed from the range forever in 2014. The “management” of these horses has consisted of removals and then payment made to contractors to take the horses off the range. This has repeatedly landed Sheldon’s into the direct line of slaughter. A constant confusion in messaging contributed to the demise of the Sheldon. News media would publish press releases from inexperienced groups, social media memes, etc and the public would write to the Bureau of Land Management (BLM) and not USFWS. The process of engagement under USFWS uses completely different terminology and went almost unengaged by the public at large. The vast majority of free roaming horses and burros in the US are under the jurisdiction of the BLM. All of the other US jurisdictions combined are a mere fraction of the land base managed for wild horses under BLM. 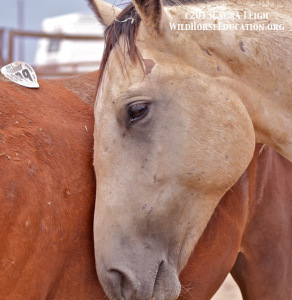 The major intent of the passage of this legislation was protection for wild horses and burros from “capture, branding, harassment and death” as is stated at the beginning of the Wild Free Roaming Horses and Burros Act (WFRH&B Act). “Mustanging,” a brutal practice of capture and sale to slaughter, had outraged the American public. In 1971, an election year, Richard Nixon signed the Act into law. However the law had a huge backlash from those that had profited from running horses down in the desert, hog tying them to wait for the kill truck and then grinding them up for fertilizer and chicken feed. These individuals were often the livestock permittees, or their families and “cowboys,” that felt the federal government had no right to claim jurisdiction and take away their ability to make a profit (even though they were eliminating our American Mustang from the landscape). The anger has not faded. (We have written and successfully litigated provisions of the Act that still maintain the original language of “humane” handling. Much is available on our site and may be very pertinent as the issues of slaughter continue to be raised). 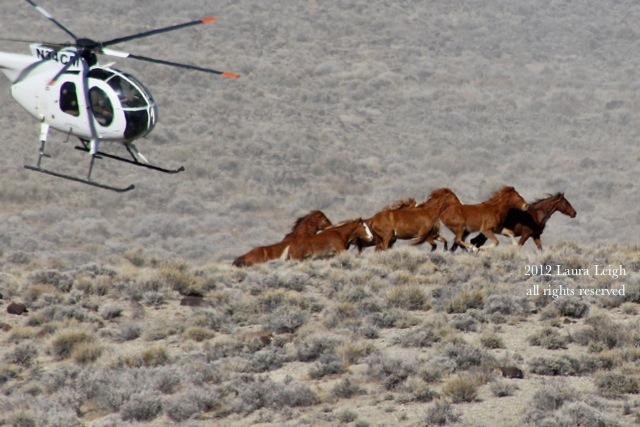 * Forest Service does not have Herd Management Areas (HMAs) they use Wild Horse Territory (WHT). Forest Service is supposed to manage in conjunction with BLM. Many WHT’s border HMAs. and many of those areas do have some form of overlap in management. Forest Service is even more of a mess than BLM with more staffing and budget issues. Most often we see a “pass the buck” management style. In many instances the law blurs and it becomes unclear if Forest Service is held to the 71 mandates or not? We need a new law. Much of the original intent of the law was undercut as special interests lobbied to remove protections, remove horses in favor of more livestock and generally attempt a return to “the good ol’ days.” The most outrageous was the “Burn’s Amendment.” This addition to a massive omnibus spending bill in 2004 had legislators claiming they did not know the amendment was in the bill or they would not have signed it. (see the last section of this article for more). So as a result of the backlash, and the likely illegality of the method used by Burns to get the legislation through, Congress began to “defund” the provisions of “sale authority” that created the “without limitation” aspect of the provision. In other words… BLM could still “sell” horses, instead of using the “adoption” requirements. However they could use “no tax payer money” (that means transport, employee salaries to approve such sales, or any money whatsoever) to sell wild horses to slaughter. 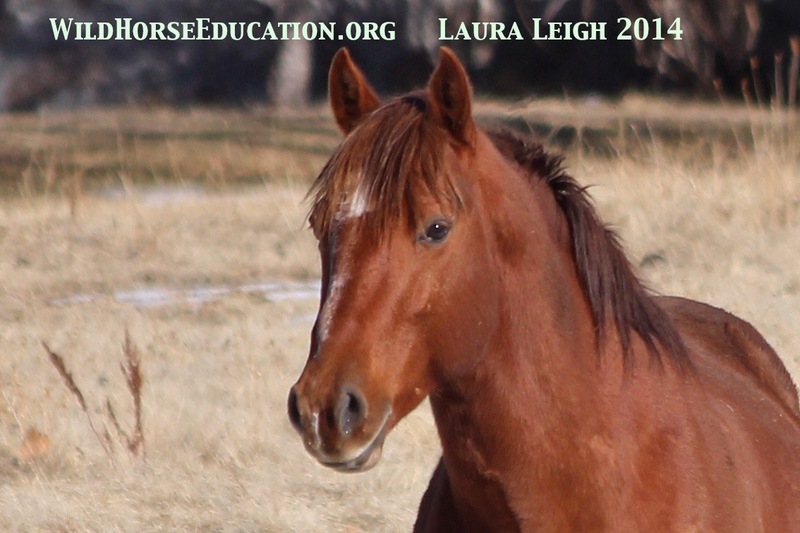 The “defunded” provision also disallowed the euthanasia (killing) of a healthy wild horse. So without repealing the provision of “sale authority” Congress limited the scope of it. This set up the yearly fight to “defund” the provisions of unlimited sales, slaughter, of wild horses we face today. Now we have a provision of the Act limited by Congressional authority through “Appropriations,” or what the tax payer actually pays for. Appropriations is spending by the government, the budget, and it is a fight every single year. 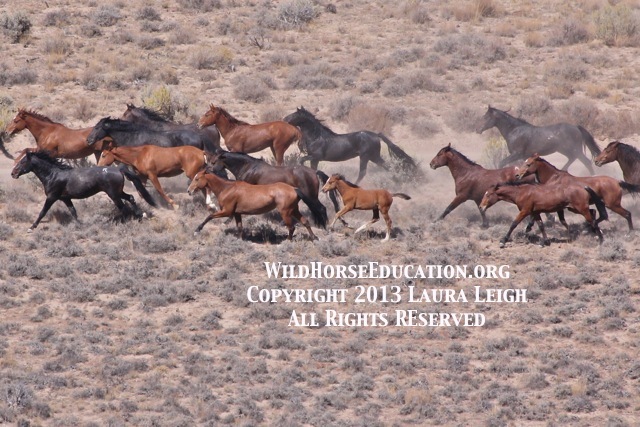 In 2012 Wild Horse Education assisted Pulitzer prize nominee Dave Philipps in an investigation that showed 1700 wild horses were not only sold to one kill buyer, Tom Davis, but that the US tax payer had even paid the shipping costs (http://wildhorseeducation.org/1700-wild-horses/). (** As of the writing of this piece in May of 2014 BLM has still issued no official statement on the “investigation” they initiated on the Tom Davis “incident.” They have not complied with the Government Accounting Office (GAO) and supplied the material on their “investigation” into this matter by “2013.” However Ken Salazar is no longer the Secretary of the Interior after threatening to punch journalist Dave Philipps in the face if he asked any more public questions about wild horses at a campaign rally for President Obama). 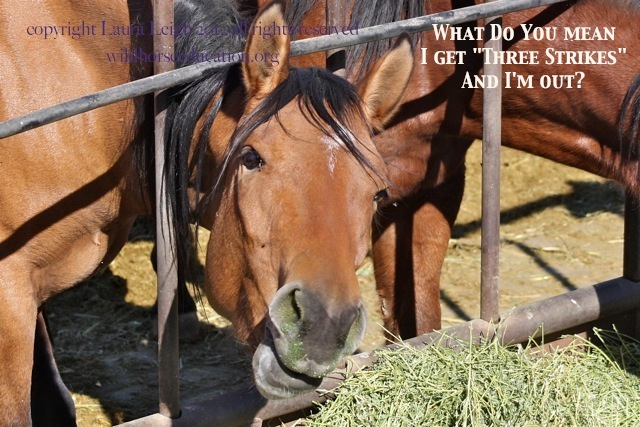 What does all of this mean for a BLM horse right now? Today… right now… it would be a violation of BLM policy and a violation of the Appropriations bill… for BLM to kill healthy wild horses in holding or ship them to slaughter. Right now… that is a truth. Yet with everything “BLM” there are a multitude of layers. Issues of “slaughter, no slaughter” are simpler in jurisdictions where protections do not exist. But in the management of the vast majority of our wild horses the issues get muddy. RIGHT NOW we have a huge “anti wild horse” campaign run by those that compete for every blade of grass that grows on public land, the livestock industry. Rooted in resentment over “federal jurisdiction of public lands” this is a highly politicized minefield. Litigation and multiple PR videos and articles are being written (in what is again an election year where propaganda has a habit of running thick) against wild horses and pushing this notion that “wild horses are over running our western landscape and bringing on the apocalypse” and the only way to “save us all” is to start killing wild horses. 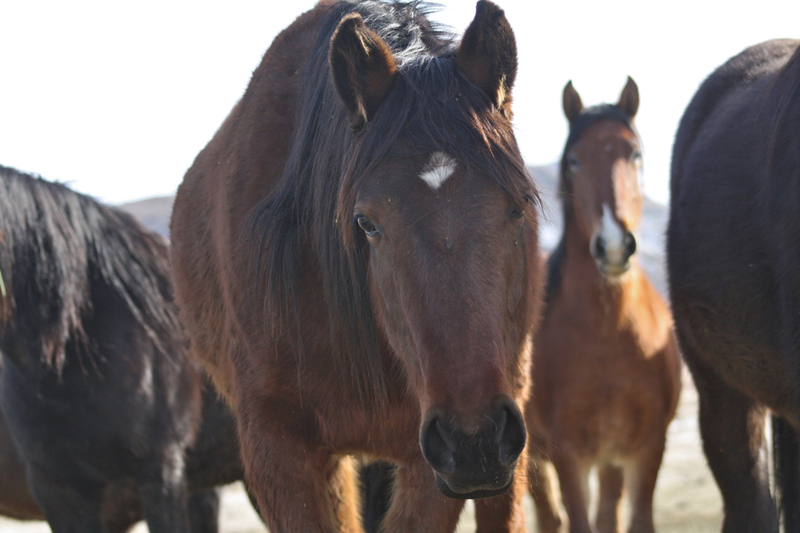 First we have the NACO legal action aimed at removal and destruction of wild horses in Nevada: http://wildhorseeducation.org/naco/ We have intervener status and are actively involved. The case is not likely to go any further than the first round of Dismissal briefs (a programmatic challenge is not allowed) but if it is allowed to continue in the courts in any form, we are working to address each area in full. We have a propaganda storm that includes such gems as “Rangeland Under Fire.” If one believes the message of this documentary then the only alternative we have as a nation to avoid starvation and “taking a wheel barrel full of money to the grocery store to buy a loaf of bread,” (quote from cattle rancher JJ Goicochea) is to get those damn horses off the range. Our narrator cites a national increase in seafood imports as a reason to support cattle ranching on public land… yet he fails to mention profits from cattle sales are at an all time high. A multitude of County Commissioners are up for reelection and are “chest thumping” everywhere you look. Trying to regain their jobs in a tough economy we hear all kinds of bravado including a Commissioner organizing an ATV ride through an off limits historic site on BLM land. “Revolution,” even one that destroys artifacts and violates the rights of others, appears to be a political slogan in cattle country. Without going into the entire complaint and where it fails (as “we” are a party to this litigation and there are issues that must remain between us and our attorney) this article will address a single area that pertains to this article (slaughter) and the questions we are receiving from the public. As an organization that has a primary mission of “education” we would be remiss in our obligations if we failed to respond. See paragraph 3 on page 5 section labelled (d): set aside improper management actions alleged herin, such as the stockpiling of horses and burros in holding areas without compliance with the mandatory provisions of the Act; then it goes on to claim actions “unlawfully withheld.” If you continue to read the document you will see that what they want is horses killed outright or sold to slaughter. We are getting multiple emails that address this. We need to be perfectly clear here… the “Burns Amendment” has not been “repealed” leaving it as a “conversation” that those that want wild horses off the range, or those that want to make a profit from slaughtering them, can make. But that does not make their conversation a valid one. Today… right now… it would be a violation of BLM policy and a violation of the Appropriations bill… for BLM to kill healthy wild horses in holding or ship them to slaughter. Right now… that is a truth. It does not mean BLM horses wont go to slaughter. As with the 1700 wild horses BLM shipped to Tom Davis they violated expressed policy to the public and violated Appropriations. We are waiting (not quietly) for Congress to continue to push for accountability (beyond Secretary Salazar’s resignation). However right now… today… it is a violation of policy and of the Appropriations bill for BLM to ship “truckloads” to killbuyers or to kill healthy wild horses. Furthermore in December of 2000 in U.S. District Court in Reno, Judge Howard McKibben told the Bureau of Land Management (BLM) that it is moving too slowly and not working hard enough to implement “very simple steps” to prevent adopted wild horses from ending up at slaughterhouses. Judge McKibben asked the BLM to submit more information within 60 days on the number of horses slaughtered in the last two years and whether it has prosecuted those cases, and to state for the record that it will no longer title horses unless the adopter signs a sworn attestation not to use the horse for slaughter. This case was dropped by Plaintiff’s at the last minute. In interviews they cited horses not protected under the act as the reasoning, however it is this writer’s opinion that the explanation lacks specific cause to drop the suit. By reading the above order, and knowing the difficulties, we are aware that there is usually a lot more at issue than ever makes print, and we may never know why that case was dropped. However it appears that shortly after this Senator Conrad Burns (with or without the help of Nevada’s Harry Reid) began to craft the Burns Amendment to negate the 1987 ruling (and it’s resurrection in 2000 in an additional filing) by Judge McKibben. The passage of the Burns Amendment sent extensive ripples through the entire BLM program. Remember… Burns inserted his one-page rider into a 3,300-page omnibus spending bill right at the congressional deadline, and there would be no opportunity for either public or legislative debate. Even with protests from Congressmen themselves, President Bush signed the bill without removing the Rider. In May of 2005 the House created a bi-partisan bill to remove the Rider. But like any legislation it had to run through a committee and the Chairman of that committee was Conrad Burns. The ONLY way to stop the challenge is to remove what NEVER should have been allowed. That amendment should have been removed by Bush before ever signing that bill. It was not appropriate in any way. We must remove the dirty hand of Conrad Burns from the ‘act’ forever. WE ARE FIGHTING AGAIN IN APPROPRIATIONS to stop wild horses from being killed and slaughtered. WE ARE FIGHTING THE WHEEL OF CORRUPTION that sets this up every single year. The wheel must break if we are ever to see fair, sustainable, management of America’s wild horses.